The course is structured in the form of an apprenticeship. Most training courses are expensive and the majority of the training takes place in a classroom. Our apprenticeship is 90% hands on. You will learn all phases of basic and advanced obedience, behavior modification, housebreaking, puppy training, among numerous other areas. We do not hold large classes in order to allow for more one-on-one teaching. We generally keep the class size to two participants at a time. 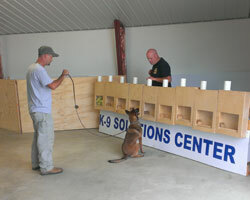 This also gives the participant more opportunity to have substantial time with numerous dogs and to practice teaching. A certificate and a course outline showing your education is issued upon successful completion. Our custom course allows you to choose the topics you want to cover, and the length of the trainer's course is determined by what you choose. Right now we are running a lot of detection courses, and they are running 1 or 2 weeks. 1 week for experienced handlers and 2 weeks for trainers with less experience. All courses are $750 per week. Lodging is not included, but available in the area for about $200 per 7 day week. Please contact us to schedule an individual Instructor / Trainer Course.